I love soft boiled eggs. But the perfect soft boiled egg is tricky to achieve. Soft boiled eggs are an important part of the GAPS Intro Diet: they allow you to cook the egg white, while still receiving the bioavailable nutrients that raw yolks are packed with. And, really, everyone should be enjoying them! I hated yolks growing up. I refused to go anywhere near a fried egg and I only ate the whites of hard boiled eggs. 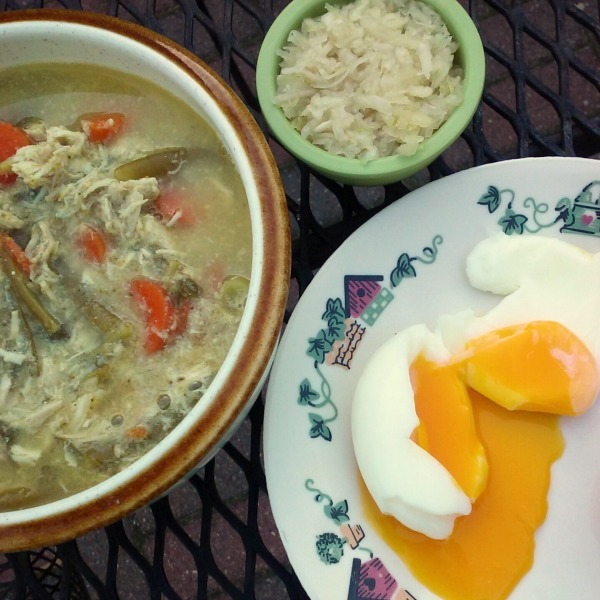 But when I tasted a soft boiled egg for the first time, from a pastured, non-GMO chicken….wow. Nutrient dense eggs yolks from happy chickens are delicious! And if the chickens that the eggs come from are healthy, you do not have to worry about the safety of raw yolk. Many factors come into play while cooking. How do you know when the white is fully cooked, but the yolk is still raw? Once I discovered my love for soft boiled eggs, I sought out a simple way to make a perfect soft boiled egg – a more difficult task than I had anticipated! Finally, I found a tip from America’s Test Kitchen that made all the difference. First, bring the water to a boil before adding the eggs. By doing this, you don’t have to worry about the power of your stove affecting the timing. Once the water is boiling, the temperature remains constant the entire time the egg is cooking. Then once you discover the length of time that yields your perfect soft boiled egg (this tutorial works for hard boiled, too), the timing will stay the same every time you cook an egg. Keeping the lid on also helps with your egg cooking. It saves time and water. Add just an inch or so of water into a pot or pan that is large enough to hold all your eggs. Bring to a boil (which takes less time, thanks to less water), add your eggs, and cover. This steams the eggs and lets them cook evenly without having to completely cover them with water. They also do not jostle around as much and you don’t have to drop the eggs in, so chances of breaking are reduced. Rinse the eggs. When the eggs are finished cooking, immediately bring them over to the sink and run under cold water. Do this until the eggs no longer feel warm as the are under the water. It is okay if they warm back up when you take them out of the water. This step halts the cooking, to ensure that when you break into your egg it is still perfectly cooked. But even more importantly – it makes them easy to peel! Since I started rinsing my eggs with cold water, all of my shells have come off with no problem. It is so nice to actually get a whole, beautiful egg instead of losing them to the shell! 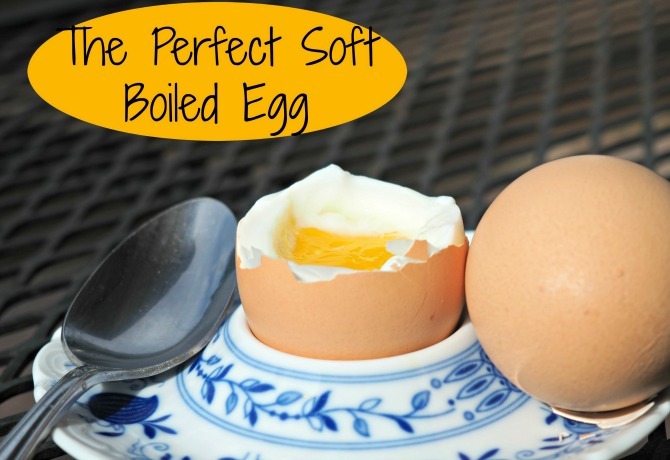 The perfect soft boiled egg is hard to achieve - until now! Enjoy these eggs, cooked to perfection, as a GAPS Intro (stage two) breakfast or snack. Select a pot that will fit all your eggs in a single layer. Fill pot with an inch of water. Bring to a boil on the stove. Place eggs in the water. Use a spoon to prevent burns if necessary. Cook for 6 1/2 minutes, or the length of time that gives you your favorite doneness. Drain and rinse with cold water until eggs no longer feel hot to the touch. I enjoy my soft boiled eggs mashed with avocado and Real Salt. What is your favorite way to eat eggs? Shared on Allergy Free Wednesday and Wildcrafting Wednesday. Out of 6 eggs, 4 came out perfectly! And, were oh, so, delicious. 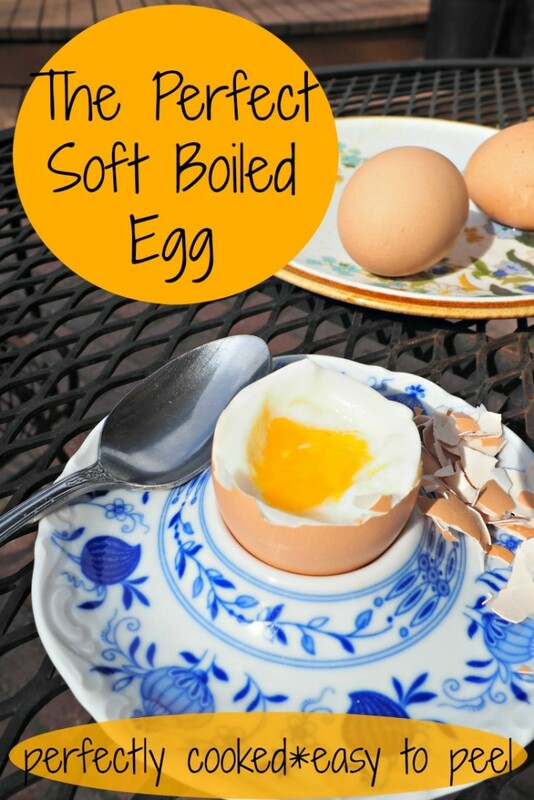 Soft boiled eggs are my favorite and this seems to be the exact science way to cook them. Unfortunately, 2 of the eggs cracked as soon as they hit the boiling water. Egg white and yolk spread all throughout the cooking water, but I waited to clean it up after the others were done. Any suggestions for keeping this from happening in the future would be appreciated! That’s great! The eggs breaking happens to us occasionally, too. They are still cooked well and taste great, they just aren’t as pretty. I find it generally only happens if I drop the eggs. If I lay them in very gentle or lower them in with a spoon or something, it generally avoids this. I came upon this same technique through trial-and-error trying to make a soft-boiled egg that can be easily peeled. Most important thing is your cooking your eggs at the temperature of boiling water and always know how long they’ll take. 1. Turn the heat off and let the water stop boiling for a minute just before adding. Once you them, turn the heat back up and adjust to get the water to a low boil. 2. Use a good tool to lower the eggs carefully. I find an ice cream scoop to be the perfect size to cradle an egg and lower into the pan so I never drop them. It’s super easy! I do it almost every day and I love it when I want an easy protein for my meal. This is great!! I’m sharing this tomorrow on my page! Thanks, Chloe. Great tips, getting that timing just right can be tricky! I’ve never soft boiled an egg, so I will have to save this tutorial for later. You make it look so easy! I definitely want to try this soon so I can pair 1-2 eggs with some ramen, soup, or a salad. Yum! Sounds yummy! It is super easy – definitely try it soon! Oh I love this! When my son was around 9 months, I would make a soft boiled egg for him every morning. I swear this is why he is so smart now! Childhood memories here!! My mother would make these, put them in a bowl with a bit of butter salt and pepper…yummy! Wonder how much to vary time for jumbo eggs? Also how much longer would it be to hard boil? I’m not sure; I’ve never used jumbo eggs before. You could try adding a minute or two and see if it is cooked to your liking.